At the upcoming ACHEMA 2015 in Frankfurt/Main, the Romaco Group will show end-to-end solutions for granulation and coating, tableting and primary and secondary packaging. Romaco will additionally unveil a blister line with an integrated anti-counterfeiting system that enables the primary packaging to be unequivocally identified. A new aseptic microdosing machine with 100% weight control and the next generation of Romaco’s Remote Assist will also be among the technological highlights. With its acquisition of Innojet Herbert Hüttlin in February 2015, the Romaco Group became the first supplier to manage the entire process chain for manufacturing and packing pharmaceutical solids. Romaco Innojet’s high-efficiency solutions for gentle granulation and coating processes are based on the patented air flow bed technology. Originally developed by Dr Herbert Hüttlin, this method particularly impresses with its linear scale-up of all process parameters and allows up to 75% shorter processing times compared to conventional technologies. 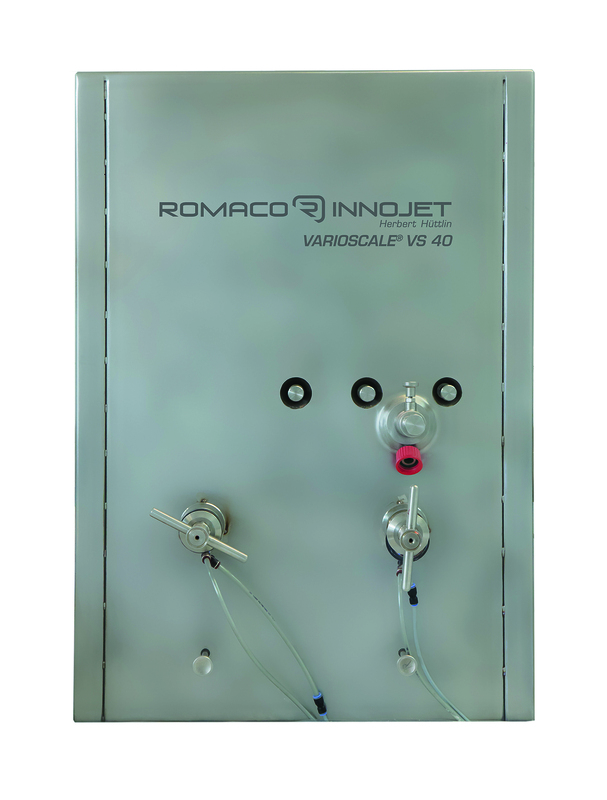 The Romaco Innojet exhibit will include the Varioscale VS 40 system module – the first coating system for totally variable batch sizes, which represents the ideal choice for solid particles such as tablets of any size and shape as well as soft or hard gelatine capsules. Following the market launch of the Kilian KTP 420X single-sided rotary press at Interpack 2014, Romaco Kilian’s double-sided version – the Kilian KTP 720X – will make its debut this year at ACHEMA. This high speed press, designed for manufacturing mono and bi-layer formats, compresses up to 1,020,000 tablets an hour. Both presses in the KTP X series are eminently suited for processing temperature sensitive products like Ibuprofen or Metformin. Optimal cleanability in mono mode and rapid batch changes were key design priorities. Thanks to the large HMI panel with swipe functionality, the Romaco tablet presses are moreover very simple to operate. The Macofar MicroMaxX 18 microdosing machine will introduce Romaco’s brand new product family, which continues the manufacturer’s tradition of innovative solutions for aseptic microdosing. The Macofar MicroMaxX 18 provides exceptionally high flexibility. It is equally suitable for processing pharmaceutical powders and sterile liquids and meets all the requirements for downstream freeze-drying. The two dosing discs allow multiple dosing into the same vial, so that the product can be filled in two process steps. Meanwhile the Romaco Group will take advantage of ACHEMA to introduce its Noack 960 blister solution with integrated anti-counterfeiting system for pharmaceuticals. The new technology, developed in an exclusive partnership with NANO 4 U, meets all the requirements of the EU’s Falsified Medicines Directive 2011/62/EU. A unique stamped hologram, which identifies each blister unequivocally, provides proof of originality. This cGMP compliant blister system built by Romaco Noack additionally boasts short cleaning times, quick format changes and an advanced level of automation. The Noack 960 blister machine is offered with rotary or platen sealing and packs pharmaceutical solids in a variety of shapes and sizes. The interchangeable QuickFeed unit enables parallel operating steps instead of sequential.